All good things must come to an end. Here in Virginia we are winding down our summer as Labor Day looms tomorrow. Although it’s not yet Fall, we are “required” to put away our white trousers, spectator shoes, white bucks, straw hats and seersucker suits until Memorial Day next year. And all this while the temperature remains north 90ºF. We have, however, been blessed with a weekend of extremely moderate termperatures. So delightful, in fact, that we decided on a formal dinner to celebrate our dear friend’s birthday. Since her’s is right before Labor Day and mine is on Memorial Day, we have a pair of elegant bookends to the summer. We usher in white linen with my birthday and see out the white dinner jackets for Mrs. W’s. The picture above illustrates my dress for the evening. 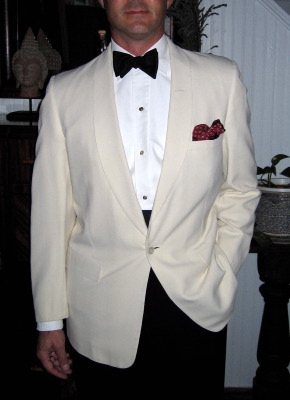 A vintage Hart, Shaffner & Marx white dinner jacket and a pair of vintage, midnight blue tuxedo trousers. The marcella dinner shirt is by Budd and the unseen velvet slippers by New & Lingwood, both of London, England. Studs by Tiffany, pocket square by Polo. Dinner was magnificiant — a throwback to another era. The always entertaining Mrs. E did her 50’s housewife routine, whipping up fliet mignon wrapped in bacon with a peppercorn, brandy and cream sauce (all the while clad in a hand painted, silk column of an evening gown.) Accompanied by homemade creamed spinach and rosemary potatoes, the meat really was delicious. The wine was a 2005 Malbec by the Gouguenheim winery. Having steak? Trust Argentina to do a red wine that will do it justice. This entry was posted in Entertaining and tagged dinner jacket, dinner suit, dressing, Entertaining, formal clothing, summer. Bookmark the permalink. You look mahvelous,darling. I so enjoyed seeing the dinner jacket worn so well, Chris. And a happy year for you, I hope.